Advertising jobs and recruiting candidates can be expensive, time-consuming, and frustrating – especially if it doesn’t lead to quality candidates. This is because most companies rely on humans and manual insertions and trading. There’s another option, though: programmatic advertising, which uses software to automate the buying, placement, and optimization of media inventory via an instant bidding system – in this case, job adverts. TalentAds, an automated programmatic job advertising platform, helps businesses find better applicants, faster, by reaching both passive and active job seekers using the algorithmic purchase of advertising space in real time. Businesses of all sizes, HR professionals, and recruitment agencies seeking employees simply enter the job details into TalentAds, the system automatically picks the best performing media channels to reach quality candidates. TalentAds allow you to create and manage optimized recruitment marketing job ad from one simple screen and reach top talent with smart job ads on their preferred media channels using big data and artificial intelligence. TalentAds’ proprietary technology eliminates all the hassles and guesswork associated with posting and monitoring on multiple ad networks individually. In addition, its job ad management technology continuously monitors the performance of your job ad campaigns and optimizes them for you based on big data and their predictive algorithm. You receive instant access in real time to how your job ads are performing from any device, and have the ability to evenly distribute your overall job ad budget by pausing better producing job ads and directing the remaining balance to slow producing job ads. Increased ROI: Get higher return on investment (ROI) on your job advertisement by taking advantage of programmatic advertising, which will reduce your overall media spend and optimize your recruitment budget. 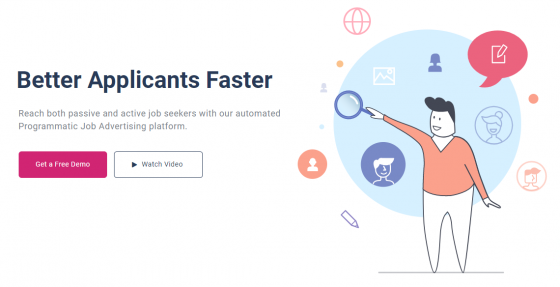 Better Quality Candidates: TalentAds helps find and attract quality candidates to your most difficult-to-fill job vacancies with its advanced targeting algorithm. User-Friendly: Thanks to its simple, easy-to-use interface, you can focus on your recruitment process rather than optimizing your job advertising. Decreased Costs: Leveraging the advantage of programmatic advertising such as real-time-bidding and better targeting options, TalentsAds may ultimately reduce your cost-per-hire up to 30%. If you’re interested in finding better applicants, faster, you can head over to TalentAds’ site and sign up for a free demo. You just tell TalentAds a few things about yourself and a representative from their team will contact you within 24 hours to schedule a demonstration.